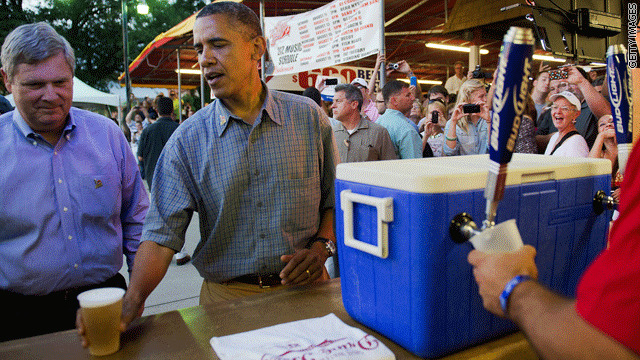 As we told you earlier in the week, President Obama recently told a voter at the Iowa State Fair that the White House has its own micro-brewery. CNN White House Correspondent Brianna Keilar follows up on finding the secret recipes. (CNN) – President Obama makes a point of being seen enjoying a beer now and again. (See here, here, here, and here). This may be no surprise, given that the winner of recent presidential elections has usually been the same person that voters have identified in polls as someone with whom they’d prefer to drink a beer. But the president even went a step further last week during his trip to Iowa, revealing to a voter that his campaign bus was stocked with beer that is brewed in the White House. Obama officials have long been tight-lipped about the home-made beer that is reportedly made with honey extracted from the White House gardens, but now home-brewing enthusiasts are hoping to force their hand. In a petition on the White House website, individuals identifying themselves as “homebrewers across America” are calling on the Obama administration to fork over the special suds recipe. “In keeping with the brewing traditions of the founding fathers, homebrewers across America call on the Obama Administration to release the recipe for the White House home brew so that it may be enjoyed by all,” the petition reads. While the White House website allows for anybody to make a petition on any matter, the administration will not formally respond unless the petition garners at least 25,000 signatures within one month. As of last count, the petition had 880 signatures. While it’s unlikely the recipe will be forked over anytime soon, White House Press Secretary Jay Carney did divulge a few details last week. “The President said there are two types - there’s a light and a dark. I think I’ve only tried the light, and it’s quite refreshing,” Carney told reporters.